Chandra has joined the other Planeswalkers, rescuing Gideon, Jace, and Nissa from the prison of agony in which Ob Nixilis had bound them. But while they were locked away, Ulamog and Kozilek rampaged across the land, leaving utter destruction in their wake. Zendikar seems on the verge of collapse. Gideon was the first to emerge from the cavern, striding into the midst of the chittering Eldrazi swarm. The creatures were pressed close together into the cleft of rock where the cave mouth opened, making them easy targets for Gideon's sural—and Chandra's blasts and cyclones of fire. Every muscle in his body ached, battered by the demon's attacks and torn by the spells of torment they had endured. But he had fallen once more into the easy rhythm of combat, bolstered by the power of the other Planeswalkers who fought at his side. Soon enough, the Eldrazi were scattered, like a wave crashing against unmoving rock. And as the last of them skittered away, as their shouts ceased and Chandra's fire dimmed and their pounding footsteps slowed, it was like sinking underwater: silent, and strangely still. As though the world had died. 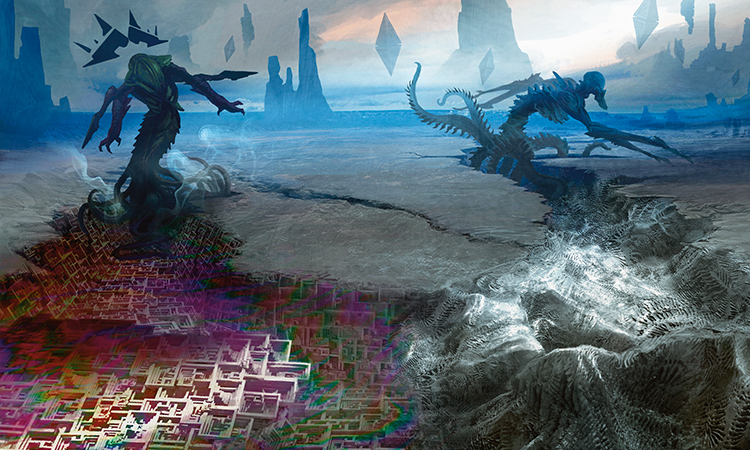 As one last Eldrazi twitched at his feet, Gideon cast a glance around at his companions. 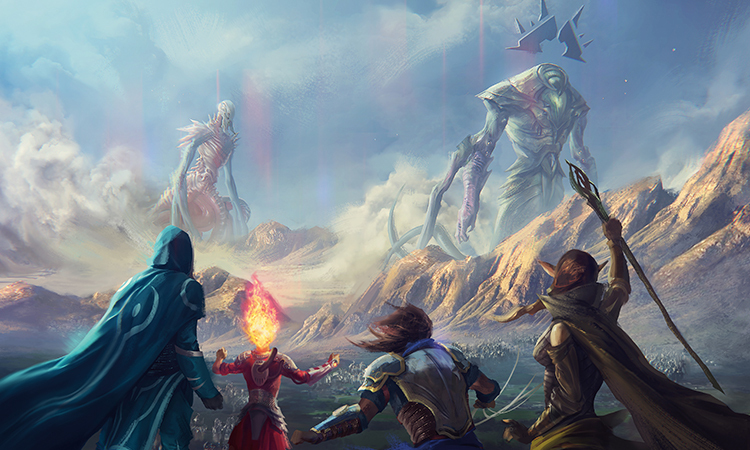 Each of them was staring in a different direction from their high vantage point in the mountains, taking in what had surely once been a striking vista—before the Eldrazi came. His own eyes swept across the ruin of Sea Gate and the desolate waste that spread out from it, and came to rest on the Eldrazi titans—two of them now. Ulamog, who had been trapped and at their mercy, and now Kozilek, whose sudden appearance had ruined everything. The titans were creeping along, not quite side by side, leaving twin trails of destruction in their wake. But where Ulamog left the all-too-familiar bony dust behind him, Kozilek's trail was a bizarre swatch of gleaming stone formed in strange square spirals, coated in a sickly sheen of violets and greens. Of course, their spawn teemed around them as well, but Gideon saw no other signs of life. His army was gone. All his work over the past months was undone. There was nothing left. Gideon turned, but Jace nodded toward Nissa. The elf had sunk to her knees, aghast at the desolation of her world. Gideon took a step toward her, but Jace tugged at his arm. "Wait," Jace whispered. "What are you going to say to her?" "Don't make promises you can't keep," Jace said firmly. 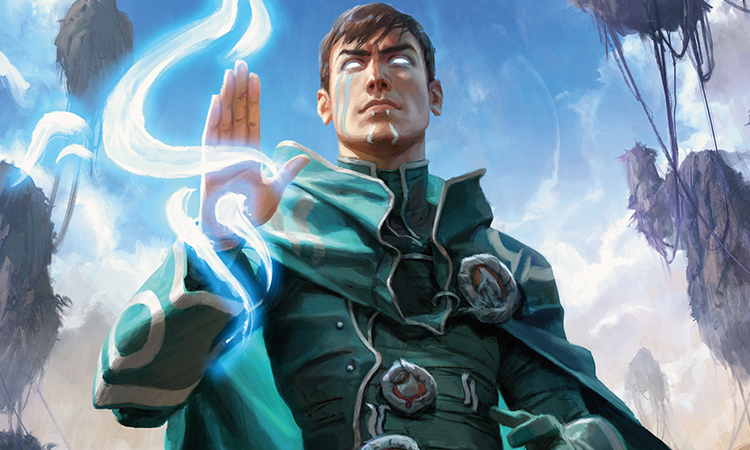 Whether of their own volition or with the mind mage's prompting, all the things he might have said to comfort Nissa came to mind: we'll get them, we'll make this right, victory is still within reach, this desolate world will live again. Empty platitudes. Jace was right—he couldn't promise those things. "I think we have to seriously consider the option of leaving Zendikar to its fate." Jace had whispered, but Nissa clearly heard him. She sprang to her feet and whirled on them, her fists clenched at her side and her green eyes flaring. "I'm not going anywhere," she said. The ground trembled ever so slightly at her words—the first sign Gideon had seen that the world still lived. Jace sighed. "Nissa," he said, "we need to be aware, at least, of the possibility that what we set out to do is impossible. Ugin thought so, and he has more experience with the Eldrazi than we will ever have." "But you know he's wrong," Nissa said. "You saw the answer. You were the one who figured it out." "How can we be sure?" Jace said. Gideon lost track of their argument. He found himself staring down at the dusty ground. Scraps of armor and crumbling weapons suggested that they were standing among the dead, walking across bodies that had crumbled to dust at the Eldrazi's touch. His stomach knotted. 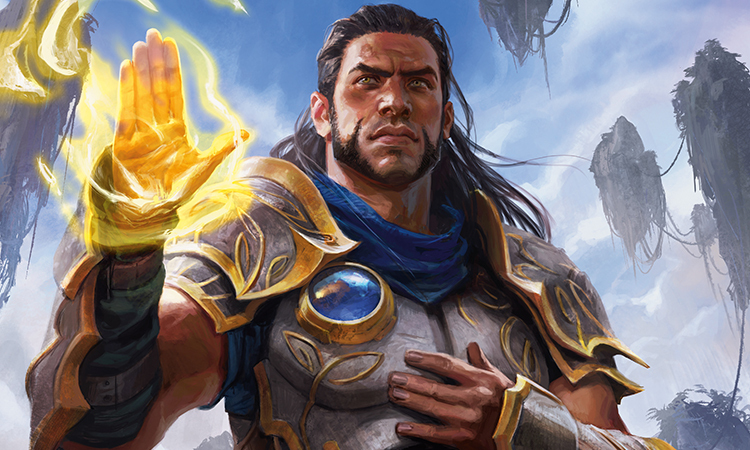 "Zendikar isn't the only world that needs our help," he heard Jace say. "Zendikar needs me," Nissa retorted. "Whatever the rest of you decide to do, I am staying here. You can all leave if that's what you want. I'm staying." Jace fell silent, and Chandra continued staring into the distance, tracing the path of the Eldrazi with her eyes while the rest of her stood uncharacteristically still. Gideon suddenly realized something remarkable: neither of them had left. Either one of them could have. Jace clearly wanted to. But not without the others. "You could leave," he said to Jace. "You could have left already, instead of trying to convince the rest of us. You too, Chandra. There's nothing binding you here. We could all leave." Nissa's jaw tightened, but she didn't speak. "For all we know, Zendikar is doomed. We could be the last people on this plane, the last ones standing between the Eldrazi and the beating heart of this world. And what can we do? What can any of us do against the Eldrazi—not one, but two monstrous titans?" "And who knows where the third one is," Jace added quietly. "Maybe there's nothing to be done. Maybe one of us—any one of us—can't do anything against such monsters." Chandra made a strangled sort of sound. "But maybe four of us can," Gideon said. Jace smiled, and Nissa's eyes widened. "I think we can," Gideon went on. "Working together, I think the four of us could stand against just about any force the Multiverse decided to throw at us. So maybe we should." Gideon lifted a hand. "Hear me out. Look at what we have already done. We bound Ulamog. We defeated that demon. Each of us is powerful, in our own way. Your fire, Chandra—your fury is an incredible force. Nissa, you understand the soul of this plane and the flow of its magic in a way the rest of us cannot grasp. Jace, I underestimated you at first, but your quick thinking and forethought have saved me time and again. Together, we can take down the Eldrazi. We can save this world. And then we can save any other world that needs us, no matter how big the threat." "You're getting ahead of yourself," Chandra said. "Maybe we should focus on the threat at hand." "No," Gideon said. "We need to focus on why we're facing that threat. It can't be about just making up for our mistakes. It can't be just a personal vendetta. This is bigger than the Eldrazi, bigger than Zendikar. We need to be committed—" He saw Chandra wince at the word, but he pressed his point. "We need to be committed, not just to getting the Eldrazi off Zendikar, but to standing together against all the forces that threaten the Multiverse. No one else can do it. This is the task that falls to us, because of our power. Because of our sparks." He took a deep breath, and rested for just a moment in the certainty that he had never been more right about anything. "I have seen civilization fall," he said. "When the Eldrazi destroyed Sea Gate, they threatened all I believe. The people of Zendikar—my whole army—were nothing more than stinging flies in their path." He shook his head. "Never again." The others were all watching him now. As he spoke, he met the gaze of each of his companions. "Not just the Eldrazi, and not just Zendikar. Never again, not on any world. This I swear: For Sea Gate, for Zendikar and all its people, for justice and peace, I will keep watch. And when any new danger arises to threaten the Multiverse, I will be there, with you three beside me." Jace nodded slowly, while Chandra folded her arms across her chest. At least one of them was still with him, Gideon thought. But it was Nissa who spoke next, kneeling to touch the dusty ground. "I have seen a world laid waste," she said. "As the Eldrazi sweep over Zendikar, the land is reduced to dust and ash. Left unchecked, they will consume it and everything on it." She stood up, dust falling from her clenched fist. "Never again," she said. "For Zendikar and the life it nurtures, for the life of every plane, I will keep watch." Jace took a step forward, looking at Chandra. "Gideon's right," he said. "The four of us have extraordinary power. We have a unique opportunity—a responsibility, even—to use that power against threats like this. The Eldrazi, yes, but there are other threats that go beyond a single plane. I've heard it said that a Planeswalker is someone who can always run from danger. But we are also the ones who can choose to stay." 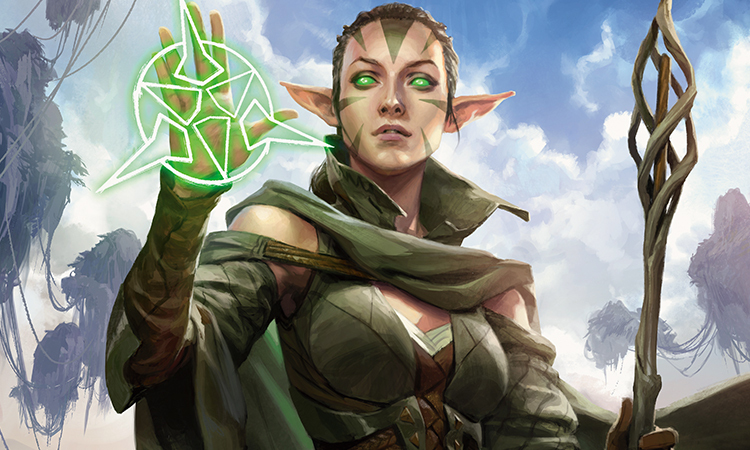 "Say the words," said Nissa, the hint of a smile breaking the mask of her anger. "Say the words," she repeated. "Like an oath." Jace returned her smile. "Fine. I've seen..." His brow furrowed and the smile faded from his lips. "I have seen a greater danger than I could have imagined. The Eldrazi don't threaten just Zendikar. If we leave here, if we leave them alone, they could consume plane after plane until even Ravnica is laid waste. At this moment, Emrakul could be drifting through the Blind Eternities, looking for another plane to devour." Gideon thought of Theros, of Bant, of Ravnica. Jace nodded decisively. "Never again. For the sake of the Multiverse, I will keep watch." Gideon's eyes turned to Chandra, and he saw Jace and Nissa regarding the pyromancer as well. He wasn't sure what to expect from her anymore—except the unexpected. "I know what you're thinking," she said. "That I could never take something like this seriously. Maybe you're right." She turned her head and met Nissa's gaze. "But here's the thing," she said. "I've seen what we can do together. And Gideon's right—none of us can handle the Eldrazi alone. It's going to take the four of us in concert, combining all our magic, to bring them down." She took a deep breath and let it out with a puff. "Every world has its tyrants, following their own desires with no concern for the people they step on. They're no different from the Eldrazi. So I'll say it: never again. If it means that people can live in freedom, yeah, I'll keep watch. With you." 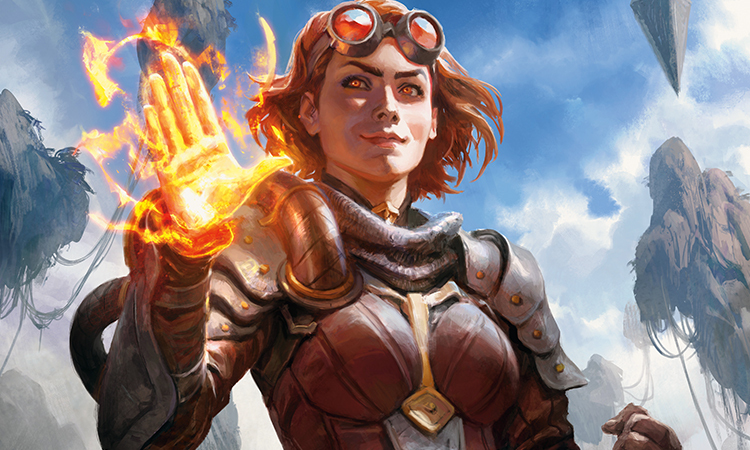 While Nissa embraced Chandra and the pyromancer surreptitiously dabbed at her eyes, Gideon reflected on the Chandra he had known on Regatha, who had been weighed down by a commitment she had made with her mouth but not taken on with her whole heart. He had a feeling this was different, and he smiled. "All right, Gideon," Chandra said as she pulled away from Nissa. "What's next? You always have a plan." "I do not," he said. "I need more information. I don't know how long we were in there, whether any soldiers are still alive—"
"I can tell you that," Chandra said. "I left Tazri and a small group of soldiers a couple miles back that way." She waved vaguely. "Tazri. Good," Gideon said. "She'll know what resources we have left." "Follow me," Chandra said, already walking. "I have some ideas," Jace added. "Maybe you can help me turn them into a plan." Gideon smiled and clapped Jace on the shoulder. Nissa was right behind Chandra, and the two men started off after them. All Gideon's work over the past months had come down to this, he realized. To these four Planeswalkers making a choice: the choice to stay, as Jace had said. The choice to fight instead of running away. A choice—a commitment, a promise. To keep watch. Even if that was all he had accomplished, it was enough.